At TAOS Gifts we understand the need to cater for all the family no matter what their dietary needs. With Easter just around the corner it can be difficult to find gifts and treats for those that may need to avoid sugar. That is why we have built a whole section of our shop with no added sugar and sugar-free products to make shopping even easier for you. These cute little Easter Figures from Cavalier are made from smooth and creamy Belgian Chocolate, each bag contains 100g of little Easter Rabbit and Chick shapes, suitable for all ages they have no sugar added and may be suitable for diabetics and others who need to avoid sugar. For those that need a sugar and or gluten-free diet, you don’t need to miss out on Easter gifts, with products such as the No added Sugar, and Gluten free Celtic Milk Chocolate Easter Egg, inside it contains delicious chocolate discs in various flavours such as orange, mint and Irish coffee. The Celtic Easter Egg is sweetened with Maltitol instead of sugar, it is also suitable where a reduced consumption of sugar, a reduction in net carb intake or a low glycemic index is desirable. Farmhouse Biscuits also have a delicious range of sugar-free cookies, including the Sugar Free Oat Crunch Cookies and the delicious Sugar Free Viennese Shortbread Cookies. As well as mini chocolate animals Cavalier Mini Belgian Chocolate Mini Easter Eggs are available in 100g bags with no sugar added, the eggs contain a smooth hazelnut praline, a delicious Easter treat or gift. Each little egg in individually wrapped in coloured foil for freshness, making them ideal to give as gifts and to use for various Easter craft projects and games. Perfect to decorate an Easter Bonnet or to add to Easter displays and gift baskets. To see our full range os sugar-free and no added sugar chocolates click here for the full and constantly growing range at TAOS Gifts. Cavalier Belgian Chocolate containing Stevia is now available at TAOS Gifts. Ideal for special diets as it doesn’t contain any added sugar, the sweet taste comes from Stevia, a natural herbal sweetener that’s more than 200 times sweeter than sugar. Stevia contains no calories and no carbohydrates, and has been used as an alternative to sugar for hundreds of years. The Stevia plant is originally native to South America where the Guarani people have been using it for sweetness for hundreds of years. The Stevia extract is taken from the Stevia plant which grows with a little help from nature’s rich soil, warm sun and generous rain. There are many great flavours and fruity combinations to choose from. Fruity, Sweet, and sugar free! 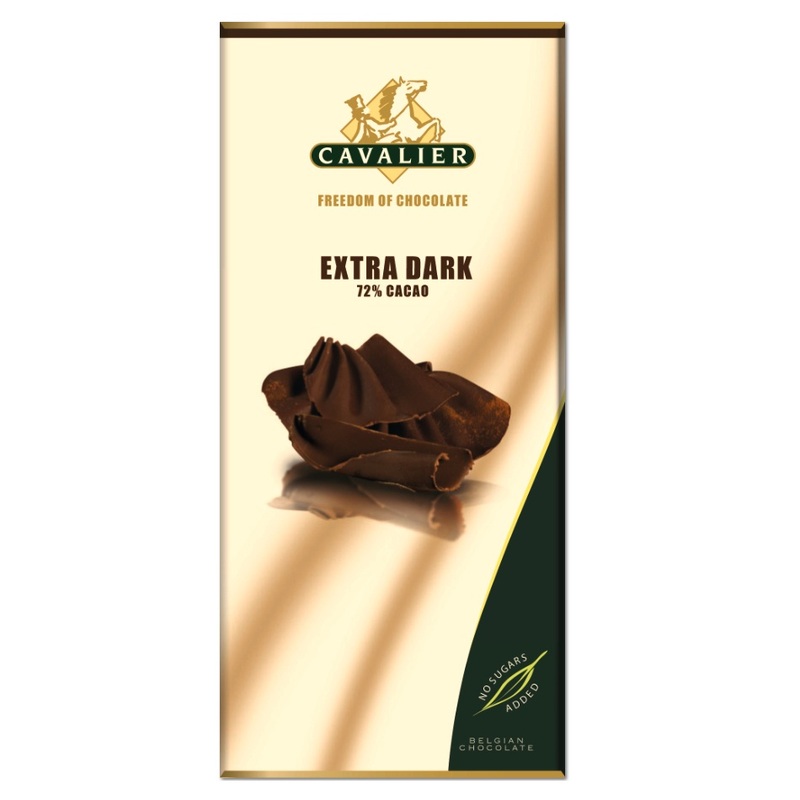 Cavalier Dark Belgian Chocolate with Stevia is a rich dark chocolate that is rich in cocoa and has a delicious sweet taste from the natural herb. As it contains Stevia, not sugar or artificial sweeteners it has no bitter after taste, no laxative effects and is kind to teeth! huge sweetening power (300 times sweeter than sugar). Only small quantities are needed, it has been frequently tested and found to be 100% safe. Unlike some sweeteners, Stevia is totally non-carcinogenic, it is also stable when heated, hence suitable for frying and boiling. Stevia is non-addictive, unlike ordinary sugar, for instance, replacing sugar with Stevia results in less plaque on teeth and fewer fillings. Stevia contains zero calories and contributes to driving down obesity. As well as all those benefits Cavalier have added a delicious fruity twist to some of their Stevia Chocolate range such as the tropical Cavalier White Mango and Raspberry White Chocolate Bar containing Stevia and dry chunks of fruit. Nut lovers can enjoy luxury Cavalier Belgian Milk Chocolate with Hazelnuts also sugar-free as it contains the natural and sweet Stevia instead of sugar. Cavalier Belgian Chocolate containing Stevia may be suitable for diabetics and others that have to follow special diets. Dark Flax Seeds and Rice Crisp Cavalier Dark Chocolate containing Stevia is a delicious rich dark Belgian dark Chocolate treat with a satisfying crunch of seeds and rice. If you are looking for a healthier option, are on a strict diet Cavalier Belgian Chocolate containing Stevia could be just the treat you have been looking for! Is Stevia (Full name Stevia Rebaudiana Bertoni) safe? Yes, research shows that Stevia is perfectly safe. Despite 10 years of research into potential downsides in quantities, no adverse effects are known of to date. On the contrary even, health benefits have been demonstrated with intake in higher quantities. The EFSA, the European Food Standards Agency, is also convinced of this and has officially approved the use of Stevia. Why are we hearing about Stevia only now? Stevia has actually been used for centuries as a natural sweetener in countries such as China, Japan, Korea, Taiwan, Israel, Uruguay, Brazil and Paraguay. In Japan for instance Stevia is added to soft drinks as a healthy replacement for aspartame. Due to the availability and the emergence of cheaper sugar and synthetic sweeteners, the effect of Stevia remained a well-kept secret in Europe. In view of the socioeconomic importance of these sectors, over the past 10 years the politicians have reviewed the policy on sugar subsidies, resulting in refineries being closed. This has created a gap for Stevia. Oat Crunch Cookies are sugar-free cookies in a gift tube, delicious traditional English biscuits made by farmhouse biscuits Ltd. Perfect to serve while entertaining guests, to give as gifts or to treat yourself during your tea break, they contain sweeteners, but no sugar so they may be suitable for diabetics and those watching their carbohydrate intake. Each tube is 16cm high and contains approximately 9 wholesome Oat Crunch Cookies. Farmhouse Biscuits also cater for those that need to follow a Gluten free diet, people who suffer from Coeliac disease, Wheat allergies or are Gluten intolerant will still be able to enjoy our delicious traditionally made English Chocolate Chip Cookies. At TAOS Gifts we have a constantly growing range of snacks and confectionary suitable for specialised diets, although we do recommend you check the ingredients as some may contain naturally occurring sugars. Perlege (ACAO) Luxury Belgian Chocolate Milk & Cinnamon is a creamy Belgian milk chocolate with just the right amount of cinnamon added to give it that little extra kick, with no sugar added and gluten-free it is suitable for some specialised diets, but as tasty as it is don’t eat too many bars as it can have a laxative effect. If you prefer your chocolate dark, then try the luxurious Perlege Belgian No Sugar Added Dark Chocolate with crunchy cocoa nibs, a divine blend of dark Belgian Chocolate with crunchy cocoa an essential treat for any serious chocoholic! To make shopping even easier we have a whole section dedicated to delicious chocolate bars with no sugar added, with top names to choose from including Perlege, Guylian and Cavalier! Enjoy the taste of Summer with A small fruity bar of Cavalier Belgian Chocolate with Strawberry , this is a moreish dark chocolate with no sugar added and a sweet strawberry and raspberry flavour creamy fondant centre, these small bars are a perfect self-indulgent treat, or gifts, if you can bear to part with them! The exotic Banana Milk Cavalier Belgian milk Chocolate Bar has a sweet banana creamy fondant centre, lose yourself for a few moments with the tropical flavours and smooth creamy chocolate melting in your mouth, with no added sugar it’s a perfect treat size snack to pop in your hand bag or lunch box. See our full range of sugar and gluten-free chocolate at TAOS Gifts here! 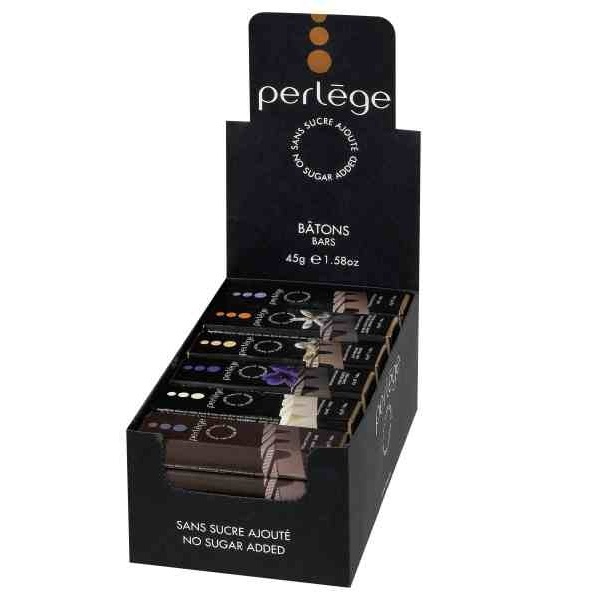 From now until 31st October 2011 (subject to stock availability) you can buy any 3 Perlege no added sugar chocolate bars (42 and 45g) and just pay for 2. Buy 2 get one free! Perlege no added sugar chocolate is very creamy and not how you would expect a no added sugar chocolate to be, it is great for Diabetics or anyone looking at following a special diet such as low GI. The chocolate is made with malitol though, so dont consume them all at once, as excessive consumption can cause laxative effects. Remember though to treat the no added sugar chocolate as a treat, and be treatwise. There are 6 varieties to choose from: Dark, Orange Dark, Violet Dark, Milk, Praline Milk and White. Why not order one of each today, at £3.00 for any 3 you cant go wrong! TAOS Gifts also have a large range of other No Added Sugar chocolates including Guylian and Cavalier, if you fancy trying some of our others. They make great stocking fillers for Christmas, buy early to avoid disappointment though as they are all selling fast.